Reed Hilderbrand rethinks Storm King Art Center’s venerable Maple Allée. as well as gather food. Mithun has made Yosemite’s Mariposa Grove a better experience for visitors as well as for its spectacular sequoias. Ashland, Oregon’s new wildfire mitigation project could serve as a model for communities throughout the West. In Ypres, Belgium, trees grow as living memorials to World War I dead. All this plus the regular Now and Goods columns. The full table of contents for March can be found here. Keep an eye out here on the blog, on the LAM Facebook page, and on our Twitter feed (@landarchmag), as we’ll be posting March articles as the month rolls out. Credits: “Taking the Wind Out of Wildfire,” City of Ashland; “Giant Steps,” Christian Runge, ASLA; “Tree Line,” The National Archives, Kew, Ordnance Survey/Wikimedia Commons; “Free Markets,” Office of Resilience, City of Atlanta; “Sugar Substitutes,” © Courtesy Storm King Art Center/Photograph by Jerry L. Thompson. From “A Forest in the City in the Forest” by Jonathan Lerner in the February 2018 issue, on Sylvatica Studio’s immersive landscape design for the Fernbank Museum of Natural History in Atlanta. Please pardon the fish smells. The landscape architects at Taylor Cullity Lethlean and Wraight + Associates were trying not to cutify the waterfront of Auckland, New Zealand, too much with their master plan for 86 acres of port. So you get a park, a promenade, a playground, and outdoor dining, but you also get the sights and smells of an active fishing sector and the noises of maritime industry up close. The North Wharf Promenade and Silo Park won the Rosa Barba Prize at the Eighth International Biennial of Landscape Architecture in Barcelona in 2014 for the ways it takes waterside work at face value but makes room for people to relax and play. Our correspondent in Sydney, Gweneth Leigh, ASLA, tells this month how it came together. You may have read in the New York Times last week about China’s push to be first in the world in developing artificial intelligence systems for things like speech recognition, rescue missions, and warfare. The newly appointed chair of landscape architecture at the University of Virginia, Bradley Cantrell, ASLA, and two colleagues recently wrote a paper in the journal Trends in Ecology & Evolution about prospects for deploying AI and “deep learning” systems in ecological restoration and management, based on several approximate examples they found currently in action. LAM invited Kristina Hill, an associate professor of landscape architecture and environmental planning and urban design at the University of California, Berkeley, to query the authors’ assumptions and, ultimately, ethical questions around such projected uses for AI, such as: Is a human-induced machine responsible for the effects of its actions, or is the human? Back in 2008 the Atlanta BeltLine, the ambitious linear park planned to ring around the city, was just getting off the ground. LAM dispatched Jonathan Lerner to survey the role this unique trail might play. Today, big sections of it have been built—though it’s by no means complete—and enthusiasm for its impacts is far from universal. And Lerner has gone back to Atlanta to survey the victories, the asymmetries, and the mixed emotions surrounding the project. In Books, don’t miss the review of two new books on logistics, by Gale Fulton, ASLA, an associate professor and chair of landscape architecture at the University of Tennessee, and what it reveals about the ways logistics not only shapes our landscapes, but has become them. The full table of contents for June can be found here. Keep an eye out here on the blog, on the LAM Facebook page, and on our Twitter feed (@landarchmag), as we’ll be ungating June articles as the month rolls out. 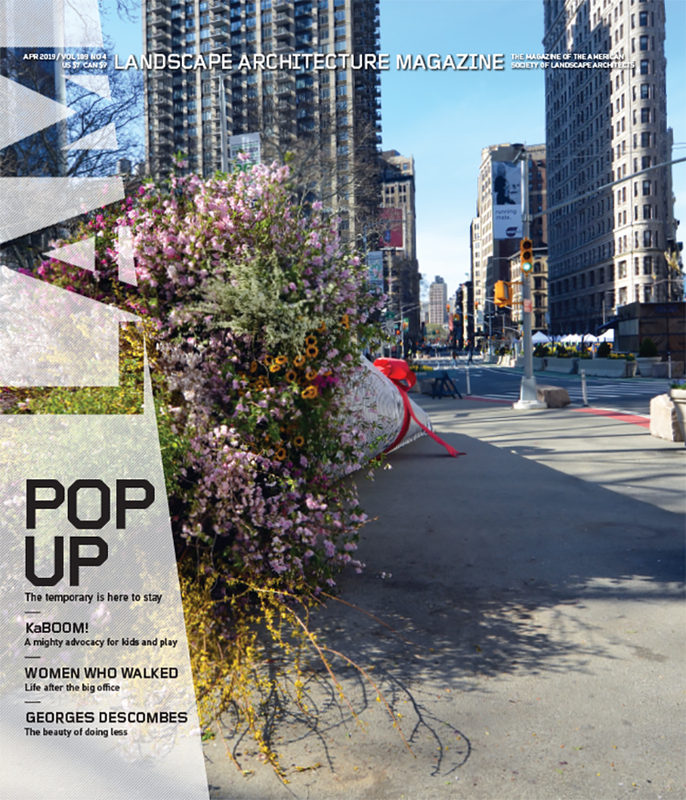 Credits: “Ecology on Autopilot,” Bradley Cantrell, ASLA; “The Wharf at Work,” Simon Devitt; “A Thousand Moving Parts,” Jeff Keesee; “In Search Of,” Courtesy HBB Landscape Architecture/Jed Share Photography; “Tame the Sun,” Courtesy SWA Group; “Yonkers Uncorked,” Christopher St. Lawrence. The Atlanta BeltLine Eastside Trail. Photo courtesy of John Becker. When the urban planner Ryan Gravel resigned from the Atlanta BeltLine Partnership board on September 26, the organization lost one of its most vocal and influential proponents, and in a way, its own creator. The BeltLine, a 22-mile network of parks and trails that weaves through 45 Atlanta neighborhoods, grew out of Gravel’s 1999 Georgia Tech master’s thesis. His consistent message regarding his departure has been that he had to distance himself from the Atlanta BeltLine Partnership (ABP) board because the organization wasn’t doing enough to provide affordable housing and maintain an atmosphere of diversity and inclusion for residents living near the trail.